Venus reaches its point of greatest brilliancy on February 15 when its increasing distance and the broadening width of its crescent reach an optimum combination. Venus will perform a balancing act this week. Normally Venus, like most objects in space, gets fainter as it gets farther away from Earth. However, as Venus moves around the sun, it is lit from different angles, and this also affects its brightness. Astronomers use a strange scale to describe the brightness of objects in the sky. This derives from a scale of star brightness first established by Claudius Ptolemy in the 2nd century. Ptolemy declared the 20 brightest stars in the sky to be "of the first magnitude," and the faintest stars he could see to be "of the sixth magnitude." Once he established these two end points for his scale, he could assign the stars of intervening brightness to the various steps on the scale. Why six levels of brightness? No one will ever know, but he was probably influenced by ancient astronomers who found six a much more mathematically friendly number than ten. In 1856, British astronomer Norman Robert Pogson attempted to apply modern mathematics to Ptolemy’s scale. He noticed that first magnitude stars were almost exactly 100 times brighter than sixth magnitude stars, and used that to establish a logarithmic relationship between star brightnesses. The main problem was what to do with objects that were brighter than first magnitude. Pogson extended the scale "upwards" from 1st magnitude to 0 magnitude, minus 1 magnitude, and beyond. On Pogson’s scale the brightest star, Sirius, comes in at magnitude minus 1.44, the full moon at minus 12.7, and the sun at minus 26.75. 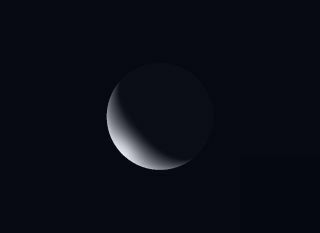 Venus at its faintest is magnitude minus 3.8. This week it peaks at minus 4.9. How bright is magnitude minus 4.9? It is 3.5 magnitudes brighter than Sirius, which works out to 25 times brighter. This is bright enough to cast shadows on a dark night. It used to be said that Venus was the brightest object in the sky other than the sun and moon, but that is no longer true. The International Space Station, with its huge solar panels, now outshines Venus by a comfortable margin.